[Stride]-Stride Step-[Choose one or more cards with the sum of their grades being 3 or greater from your hand, and discard them] Stride this card on your (VC) from face down. [CONT](VC):This unit gets [Power]+5000 for every two cards in your bind zone. [AUTO](VC) Generation Break 2:[Soul Blast (1) & Choose a face down card named "Chronotiger Rebellion" from your G zone, and turn it face up & Choose a card from your hand and rear-guards, and bind them face up] When this unit attacks, if you have a heart card with "Chronofang" in its card name, you may pay the cost. If you do, this unit gets [Critical]+1/drive+1 until end of that battle. What your efforts in Chronofang all add up to. Rebellion's GB2, on attack, Soulblasts 1, G Persona Blasts and binds one card on your field and in your hand to give him +1 Critical and +1 Drive Check. Oh yeah, and he has another skill giving him 5k for every 2 cards in your bind zone. The only real way to play him smart as far as I can tell is to drop this after getting the opponent to waste all their guard on one or two Bind Time Dragons first, because if you drop this as soon as you can he's just going to get Perfect Guarded most of the time. All the power he can gain this late in the game seems a little pointless to me as that's 'guard everything or die' territory anyway, and all the power from being a G Unit would take one out regardless. Not for me. Unless someone in the anime steals Fang and goes on a power trip, this shows no signs of getting better. Chronofang watched Gundam Wing and was like, "I wanna be like that." 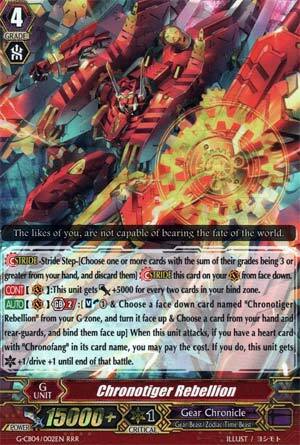 Chronotiger Rebellion is nice utility and punch wrapped in one bigass death time machine. 5k for every two bound cards you have and a crit means the opponent either PGs this, or takes the hit to the face if they're at low damage. One card from your hand and one card bound is a bit of a minus, until you look at Chronofang's support and realize the superior calls and card draws you can set up. Having 4 Drive checks also offsets the cost while adding extra pressure from the possibility of hitting 3 or 4 triggers. What are Cosmic Heroes? This card is heart restricted though, so budget Idea-Drone decks miss out on this. Aww. Either you're playing a Chronotiger build around his specific support, or a ZTB deck that appreciates the binding of ZTB units. Though I gotta say, if the opponent don't have the PG, Chonotiger Rebellion's gonna kill them before Deus Ex gets his chance. Get your 4 copies.